James A. Mitchell is the retired Chairman and CEO of the IDS Life Insurance Company, a subsidiary of American Express. In 2008, he was named one of the "100 Most Influential People in Business Ethics" by Ethisphere Magazine, a global publication dedicated to examining the connection between ethics and profitability. An honors graduate of Princeton University, Mitchell has also earned the prestigious Chartered Life Underwriter® (CLU®) and Chartered Financial Consultant® (ChFC®) designations from The American College of Financial Services. Mitchell served as Chairman of both The American College Board of Trustees and The American College Foundation Board of Directors. 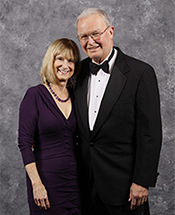 He continues to serve as a trustee, and is an emeritus director of the Foundation. In addition, he is Chairman of the Advisory Board of The American College Cary M. Maguire Center for Ethics in Financial Services and a member of the institution's President’s Circle. In 1999, The American College awarded Mr. Mitchell the Huebner Gold Medal, its highest award, in recognition of his dedication to education and professionalism in financial services. Linda R. Mitchell grew up in Des Moines, IA and graduated from the School of Journalism at the University of Iowa majoring in Public Relations. After graduation, she moved to New York City where she worked in the Executive Training Program at Bonwit Teller, a high-end department store chain, using her sales and public relations training. During the ensuing years after marrying and having two children, she continued to use her writing, speaking and public relations skills at an advertising agency, a career management services company, and an executive search firm. In retirement, she and Jim love to travel and dote on their four granddaughters.